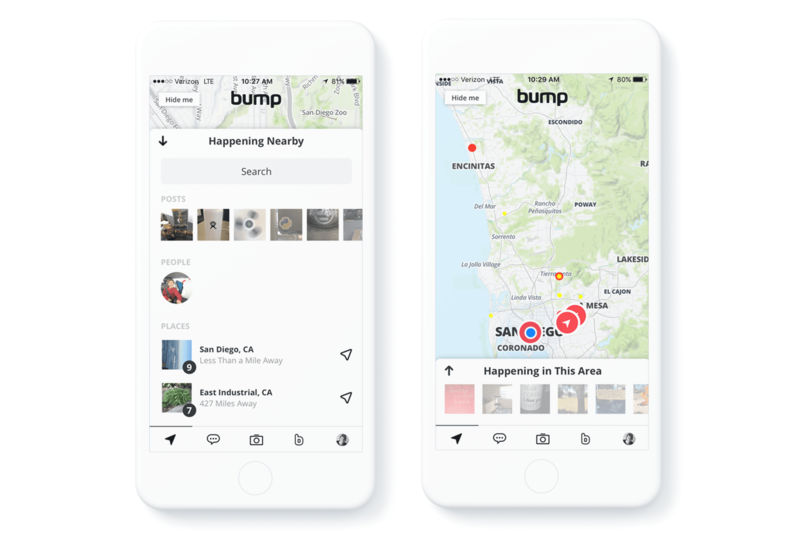 Bump is a mobile app that lets you discover the area around you in real time. You can quickly find out about fun and interesting things happening in your area. Share photos or videos that can be seen by anyone on Bump. This is the perfect app to find where the locals hang out when you’re exploring a new city or even just to be a tourist in your own city! The first step is signing up and creating your profile. You can create your unique username and upload a profile picture, which is displayed to everyone around you (unless you disable it). There are several components to the app. The main Explore view allows you to see your location on a map and any other Bump users that may be in the area. If there’s a lot happening around you, the map will have hotspots (red circles). You can browse shared activity two different ways. There is an image/video carousel that showcases the things that are happening nearby. You can watch all of the shared content or select the specific images you would like to see. You can also access the shared content via the map. The map will display clusters in areas where there is large amounts of activity. If you select the cluster, you can see the people along with the content they are sharing. Using the built-in camera feature, you can take photos or videos within the app. Then you can create a unique caption and geo-tag your photo by choosing from a list of nearby locations. The list of nearby locations is concise to ensure that you are sharing things relevant to the area. As of right now, any content you share will be accessible to others for 72 hours. You do not have the ability to delete a post from the app, so make sure you know what you’re sharing. You will also be notified when your contacts are nearby or have posted a photo or video. If you’re feeling friendly, you can even send direct messages to users. You don’t need to be ‘friends’ with them or be ‘following’ each other. It’s a great way to interact with people around you. 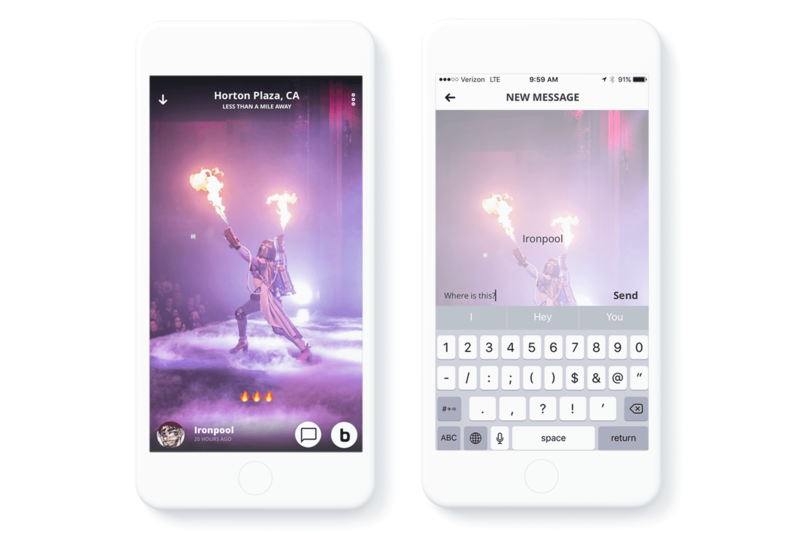 Bump is an open network so you can chat with anyone on the map who has their discoverability and chat features activated. If you see an image or video that you like, Bump it! This will notify the user that you enjoyed what they shared.